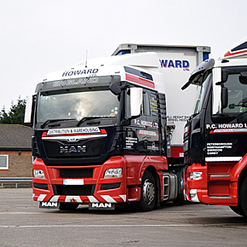 PC Howard Ltd operates over 100 heavy goods vehicles ranging in size from 7.5 tonne, 18 tonner to 44 tonne Gross capacity. The articulated units utilise a fleet of 150 trailers. All the Heavy Goods vehicles are in our distinctive but Patriotic Red, White and Blue, although it is the Dark Blue that has been our distinctive colour for over 1/2 century now. All our trailers are curtain-sided , the majority are 13.6 meters long although we are trialling the use of Urban Trailers , which are shorter and give improved access in urban areas . 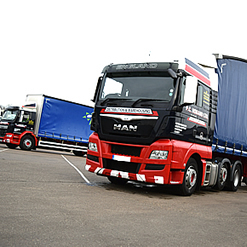 The standard trailers can carry 26 pallets or 52 pallets if they are double stacked with a pay load of 27,000kgs The height of the trailers differ in order to meet the differing needs of our customers and indeed delivery points. These can allow customers to double stack palletised goods thereby increasing the carrying capacity of the vehicles and the 'fill'. We also have a fleet of 20 Double Deck Trailers which are primarily used for the movement of palletised goods to and from the Palletways Hubs It is company policy to continually invest in our fleet to ensure that our transport is of the highest quality. Another major advantage is that we have an in-house workshop at our main site at King's Cliffe site where all our vehicles are regularly serviced and maintained. This is not typical of the industry but gives us vital flexibility and minimises down time. It means we are in charge of our own destiny and without doubt, the maintenance of our vehicles in-house has helped us to keep our fleet in tip top condition and aiding reliability, which enables us to offer transport at the very highest quality.